I began pondering about a robot that could sketch on the floor. Just after a brief browsing session I came to know about the awesome variations of such a project that people have worked upon ! The Open Sourced Turtle Robot (OSTR) inspired me the most. This project guided my thoughts to this two wheeled mechanism. But then I thought what if the robot could generate its own sketches; well that would be fun to watch whats on its micro-controlled mind :D.
I started with the arduino sketch and began building the hardware and testing the circuits. The wheels were a real toughie, finally decided to glue sunboards together with criss-crossed fibers. I tried my best to build the bot with household materials. The sketching pen is operated by a servo motor. 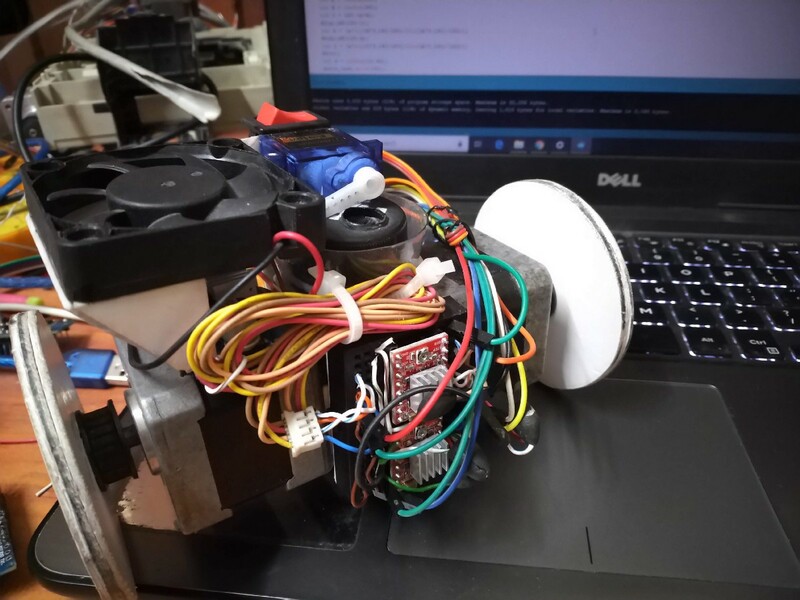 To operate the stepper motors at 12V, I used a DC to DC converted; which apparently runs very hot, had to to mount a cooling fan which kind of looked more cool 🙂 . Sadly the Arduino nano gave a lot of issues with the sketch upload, decided to go with the Arduino UNO.